Enjoy a cuppa with your favorite characters from the Harry Potter books and films with the Harry Potter Character Glossary Mug. 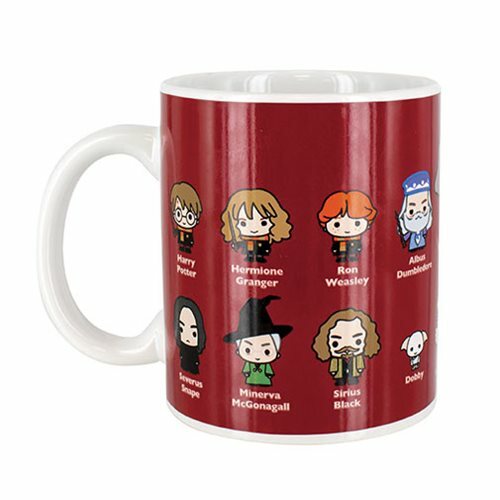 This super-cute mug features caricature drawings of a whole host of wonderful characters from Harry himself, to Hermione, Ron, Hagrid, Dumbledore and many more. This standard sized mug has a printed design and is the perfect accompaniment to your next tea break. The Harry Potter Character Glossary Mug makes a fantastic gift for lovers of the Harry Potter series. Hand wash only. Not dishwasher safe. Do not microwave.